MORE than 100 people from 43 nationalities gathered in Portlaoise last week at an inter-cultural morning to celebrate diversity and inclusion. The event took place in Portlaoise Further Education Centre (FET). Those taking part were learners with the Laois/Offaly Education Training Board involved in the literacy services. The event provided them with an opportunity to showcase their food, songs, traditions and cultures. The combination of learners included asylum seekers, migrant workers, refugees and Irish from Portlaoise FET, the Abbeyleix Direct Provision Centre and from Tullamore FET. The organisers worked hard preparing for the event, decorating the hall in many flags from around the globe. They also cooked and presented fabulous food from a wide variety of cultures, which gave everyone a chance to sample some of the cuisine on offer. Many of those present wore traditional costumes as part of the experience, as did tutor Sara Rasool. Sara is an Irish Muslim who embraced both cultures by wearing her traditional Muslim tunic and a white Connemara Aran knit. Some of the other customary garments worn were traditional Chinese, African, Vietnamese and Bangladeshi dresses. Games were also on the agenda as students tested their skill with a hurley and sliotar and then played target practice with a tyre and tried out some Gaelic football. The sound of a Nigerian drum beat advised those who knew the sound and understood its meaning as ‘music unites us’ rhythmically mimicked the intonations and rhythms of a poem. A Chinese student played the concertina and the Quran was sung by Emad Arabeldin. Irish students performed a sketch about sweeping generalisations, which highlights the way society can be negative towards other cultures with generalised remarks. A refugee spoke of her life in Kurdistan and how she had to flee her homeland with her four children. She expressed her thanks to everyone who has helped her settle in Ireland and said that she and her four children are very grateful for her life now. A Palestinian man spoke passionately about the importance of his home, but said that he can never return there, something which is very difficult for him. 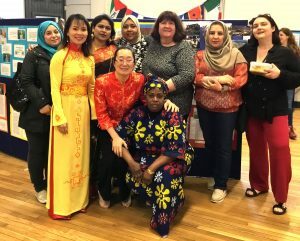 The English for speakers of other languages (ESOL) co-ordinator Deirdre Brennan said: “These people are part of our community. I am overwhelmed by their enthusiasm and generosity. The future of Ireland is a multicultural community which will bring its own benefits and challenges. Days like today will help break down barriers”.